We tested 24 measuring cups to find ones that are accurate, with durable, easy-to-read gradations. Adding a cup of milk to a recipe sounds easy enough, doesn't it? Sure, pouring the liquid is simple, but when you assume it was actually one cup—that's where the trouble starts. Our review of measuring spoons described the false sense of security the tools give you based on their stamped volume markings. Liquid measuring cups are no different: Clad in all sorts of official-looking lines, they can make it easy to think that a cup is a cup is a cup—dump in the milk, stock, or water, and feel reassured you've followed the recipe correctly. But the truth is, a measuring cup isn't always accurate, and for some home cooks, it can be a challenge to read them properly. Working with accurate cups, and knowing how to read their gradations, increases your chance of recipe success. We evaluated 24 measuring cups, with capacities ranging from two ounces to four cups, to find the ones that are the most accurate and easiest to read. 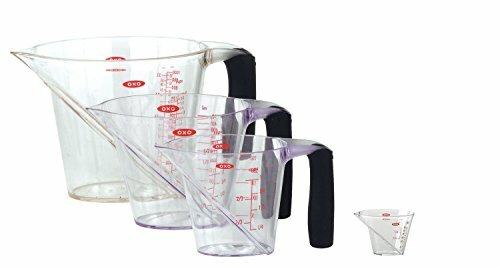 These Anchor Hocking glass measuring cups were the most accurate set we tested and include 1-, 2-, and 4-cup measures. Only the smallest cup was off by more than a milliliter at full volume, which is very accurate for kitchen use. The cups have durable, easy-to-read markings; a classic shape that nests well; and spouts that are easy to pour from. If concern over weight or risk of breaking glass has you in the market for a plastic set, these lightweight OXO Good Grips 4-Piece Angled Measuring Cups were the second most accurate ones we tested, and they include a handy 1/4-cup measure. The most erroneous member of the group was the 2-cup measure, which was off by about two teaspoons at full volume during our trials. The plastic is very clear, but the material is sensitive to heat, so it won't handle long stints in the microwave with fats, oils, or chocolate. Liquid measuring cups should be accurate, durable, and have good pour spouts and some level of heat resistance. We like sets that include 1-, 2-, and 4-cup sizes, which can tackle just about any kitchen task. In choosing which sets to test, we considered best-selling items from major retailers like Amazon, and cross-referenced reviews from other reputable brands, like America's Test Kitchen (subscription required) and The Sweethome. What our research revealed was that, somewhere along the way, manufacturers tried turning the humble measuring cup into something more elaborate, with designs that slide or plastic builds that won't fit in the microwave. Even our winning OXOs add something new—gradations fixed at an angle inside the cup, viewable from above—which helps you read the liquid's level more easily, but not necessarily with the same exactness as traditional designs allow. Accuracy is what we prize most in measuring cups, but they should also have durable gradations that won't rub away over time. When you're pouring, the stream should be easy to control and tidy, without running down the side of the cup. We also knew we wanted cups that could survive the microwave's heat—you'll likely use them to warm milk, take the chill off a few tablespoons of butter, or melt congealed gravies and sauces on their way from the refrigerator to the table. We excluded the newer style of adjustable measuring cups, because we couldn't test the durability of the thin silicone gasket that prevents liquids from dripping out. However, we did include newer squeezable silicone measuring cups, which can help with pouring pancake batter onto a griddle or muffin mix into prepared cups. 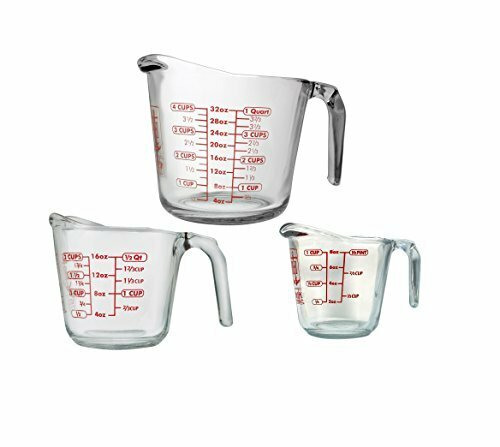 While there are inherent redundancies, we consider 1-, 2-, and 4-cup measuring cups essential. Yes, you can fill a 1-cup measurer four times, but that compromises accuracy, and it's less efficient. Dragging out a 4-cup measure first thing in the morning for eight ounces of pourover-coffee water doesn't make a lot of sense, either. A 2-cup size, with markings for 2/3, 1 1/3, and 1 2/3 cups, is useful for most jobs, but a larger, 4-cup vessel is handy when you're portioning stock or water for soups or stews. Maxing out at about eight inches in diameter for the largest cup, when all its cups are nested, a set takes up less cabinet space than a dinner plate. Of course, weight is another issue if you're buying a glass set: A 4-cup glass measure weighs about two and a half pounds, while the same size cup in plastic is just over 10 ounces. Before we get into how we tested for accuracy, the most important criterion, a quick reminder on the proper way to read a liquid measuring cup—which is, of course, an essential part of figuring out its accuracy—is in order. The curvature formed by a substance in a measuring cup is called a meniscus, and it's created by surface tension on the top of the liquid. To read a measuring cup accurately, place it on a flat, stable surface, like a table or countertop. Add the liquid until it reaches just under the gradation line you're aiming for. Then get down at eye level with the mark, and you'll notice the liquid isn't straight—it sort of walks up the walls on the edges. Carefully add more liquid until the bottom of the meniscus is level with the gradation on the cup. To gauge accuracy in our tests, we relied on an old standard: water. Because a milliliter of water weighs exactly a gram, we were able to compare the weight of the water in the cups to the markings on the sides and see if they correlated. I reached out to the Weights and Measures Division of the National Institute of Standards and Technology (NIST) and was informed that one cup of room-temperature water is approximately 236 grams. We filled each cup with water, creeping up to the gradations with an eyedropper, until the bottom of the concave meniscus was at the measuring line. We tested each cup twice, first at its half volume, then at its maximum volume. To rule out human error, we measured each volume level three times and averaged those readings. After each attempt, we dumped the water onto an accurate scale and noted the weight. (We used a calibrated jeweler's scale with a resolution of 0.01 gram for the 1-cup measures, and an accurate kitchen scale with a resolution of 0.1 gram for the 2- and 4-cup measures, due to limitations in the jeweler's scale's max capacity.) Then we compared our averages to the NIST standard to determine the accuracy of each cup. After our trials, we cross-checked our initial measurements by reversing the process: weighing out a known volume first, then pouring that into the measuring cup to ensure that the water lined up with the appropriate gradation. Want to know why some recipes fail even when you follow them closely? As these tests demonstrated, it's often saboteurs like inaccurate measuring cups. A 4-cup measurer we tested yielded more than 40 milliliters extra when filled to half volume—that's well over an ounce. Putting that much more liquid in a pan sauce you're reducing might add only extra time. But if you're baking or cooking with rice, that kind of inaccuracy can make a real difference. The risk of shattering a glass measuring cup is a concern; if you drop one on the floor, it will likely break. But short of that, the glass is quite durable, and accidentally chipping it against a pot or pan is improbable. Because the durability of the glass itself isn't worth testing (it is breakable, after all), our evaluation focused on the resilience of the markings. All of the gradations on the cups we tested were made with paint applied in some form to the outside of the measuring cup. We fitted a reciprocating saw, which moves back and forth 3,000 times per minute, with a heavy-duty synthetic scouring pad that is normally used to clean grill grates. After lubricating the pad with water, we used the saw to scrub the markings for 30 seconds, then checked for wear. The good news is that all the glass and most of the plastic measuring cups survived, though one lost its markings almost entirely, earning a disqualification. Lingering food stains, the evidence of past recipes, aren't just unsightly—they can also make a measuring cup hard to read. We heated oily and acidic tomato sauce to a simmer, then ladled it into each measuring cup and let the cups sit for 12 hours. The glass cups didn't stain at all, and neither did the plastic ones. But the flexible silicone ones, which we had found to be relatively accurate, did: A hazy pink tint was left on the walls of the cup, making it harder to read the gradations. While we can see using these for controlled dispensing of hot or thick ingredients, they'd never be our primary measuring cups. We tested how easy it was to warm honey and remove it from the measuring cups. Similar to those of a saucier, the rounded corners on most cups can accommodate a flexible spatula and make scooping out honey simpler. Since our testing took place in a 75°F (24°C) kitchen, we didn't experience the same difficulty with honey that America's Test Kitchen did (subscription required): They reported that colder temps in a kitchen are retained better by the thicker glass, making it harder for sticky ingredients to level out and pour from a glass cup compared to a plastic one. Though our testing conditions were different, we can see this becoming an issue in colder months. The only cups that gave us trouble were the winning OXOs, which have angled gradations that made it harder to scrape the honey out. We also filled the measuring cups to half volume with water and heated them to a boil in the microwave, in order to determine whether the handles stayed comfortably cool. This test also led to a couple of disqualifications: One innovative glass beaker design had a sliding plastic collar with gradations on it that moved up and down, mimicking a scale's tare function. But it softened and deformed in the microwave before hardening again. Another measuring cup, about eight and a quarter inches tall, wouldn't even fit in the microwave. Fortunately, all of the handles were cool enough to grab out of the microwave, though the flexible silicone tended to get the warmest, up to around 115°F (46°C). After running the measuring cups through all the above tests, and eliminating any that performed poorly, we narrowed down our picks to the following two sets. The Anchor Hocking 3-Piece Glass Measuring Cup set was the most accurate set we tested. The 1-cup measure missed the target 236 grams by a scant 1.24 milliliters, which is extremely accurate by kitchen standards. Other 1-cup measures we tested were slightly less accurate, with one averaging 3.5 milliliters under what it should have been. The 1-, 2-, and 4-cup glass measures have a classic shape for easy nesting, and the largest cup has a narrower footprint and taller walls than other, shallower glass versions, so it takes up less space on cabinet shelves. The handles kept to a cool 89°F (32°C) during the water-boiling tests; there are no restrictions on using these cups in the microwave. The red gradations along the side of the cup are prominent, making it easy to read their location in relation to the bottom of the meniscus. When we poured measured amounts of water back into each of the cups, the meniscus was closer to the gradation than it was in other cups, which proved that the cups were accurate in addition to being easy to read. The 2-cup marking on the 2-cup measure was slightly crooked, though not enough to cause trouble when cooking. Interestingly, when filled to half volumes, some of the cups slipped in accuracy: When we added 472 milliliters of water (2 cups) back into the 4-cup measure, the bottom of the meniscus was above the gradation. While this set is heavier than plastic cups, that weight keeps the cups still on the countertop, which is handy when you're ladling hot stock or pasta water. There's a lot to like about the OXO Good Grips Angled Measuring Cup set. The cups nest neatly and are lightweight. The set's 1-, 2-, and 4-cup measures come with a smaller 1/4-cup version, which is handy for drizzling in oils or extracts. The three larger cups have comfy rubber-coated handles for excellent control while pouring, and they stay cool right out of the microwave. That said, heating is this Tritan plastic's weakness—literally. Boiling water is no problem, but oils, which have a boiling point well beyond 212°F, can melt the plastic. OXO told us that heating oils, fats, and ingredients like chocolate can also chemically react with the plastic and degrade the cup. While the plastic is clear, the liquid forms a less pronounced meniscus compared to in a glass cup, which, for some, can make it hard to read the bottom. When we filled the 2-cup measure with 472 milliliters of water, the meniscus was in line with the gradation, but during testing, we averaged over 10 milliliters over the mark—which, we believe, was due to the thinner meniscus and the less readable, short-dash-style gradation line. This demonstrates that the cup, while accurate, needs to be used with a slightly more attentive eye. The most notable feature on these cups is the angled gradations, which are handy as a quick reference, as they save you from having to crouch down to measure. However, that method isn't as accurate as checking the side of the cup. The gradations sit on a ledge that makes it more challenging to get out sticky ingredients, like honey.